The video at the bottom of this post shows me shooting an 1882 Martini-Henry rifle, the weapon used by British troops in my novel Pharaoh against the forces of the Mahdi during the 1884-5 expedition to relieve General Gordon in Khartoum. That war was one of the last major conflicts fought by European troops with black powder, though with fast-action breech-loading rifles far superior to the muzzle-loading weapons that had been the mainstay of armies only twenty years previously. With reloading now taking only seconds, these new rifles allowed a disciplined force to lay down a withering fire almost as devastating as machine-guns were to be in wars to come. ... and then he saw it, a minuscule wobbly reflection among the rocks, the white of a headdress, a briefly elevated rifle barrel. He held himself steady, staring down the sights, both eyes open, focusing on the target. There was no wind, and he could aim dead-on. He adjusted infinitesimally to the left, an instinct, no more, and then slowly exhaled until there was nothing left, and squeezed the trigger. The rifle jumped and cracked, and through the smoke he saw the figure rise upwards as if standing, but them crumple sideways and hang head first over the ledge in front of him, blood gushing and splatting down the cliff and his rifle falling with a clatter to the rocks beneath. Catridges compared: .577/450 Martini-Henry, .303 British and .22 LR. The Martini-Henry fired a massive 480 grain .45 calibre bullet, using 85 grains of Curtis and Brown powder in a .577 bottle-shaped cartridge. The British experience fighting ‘fanatics’ during the Indian Mutiny of 1857-8 had led them to favour rounds with maximum stopping power, and the .577/450 was the most powerful yet. The rifle mechanism was an immensely strong ‘falling block’, actuated by a trigger-guard lever - closing the lever raised the block and cocked the action, and pulling it down ejected the cartridge and opened the breech for the next round. The Martini-Henry was unsurpassed as a single-shot breech-loading military rifle of the period, and saw use in some of the most famous Victorian colonial conflicts - the Zulu War and the Defence of Rorke's Drift, the Afghan War of 1878-80, the Egypt and Sudan campaigns of the 1880s and numerous lesser actions involving British troops in India and elsewhere during that decade. Its main drawbacks were the problems inherent with black powder, excessive fouling and barrel overheating, rendering it obsolete in British service after the introduction of smokeless nitro propellants in the early 1890s and the adoption of the .303 bolt-action Lee-Metford and Lee-Enfield rifles. Nevertheless, a .303 version of the Martini-Henry continued to arm colonial troops until well into the 20th century, and in Afghanistan it was seen among tribal fighters in use alongside Lee-Enfields as late as the Soviet war of the 1980s. The photo above left is a rare image of British troops on the Gordon Relief Expedition - men of the 11th Hussars, in desert gear and armed with Martini-Henrys - and that on the right shows Egyptian troops some time in the late 19th century, with Remington rifles. 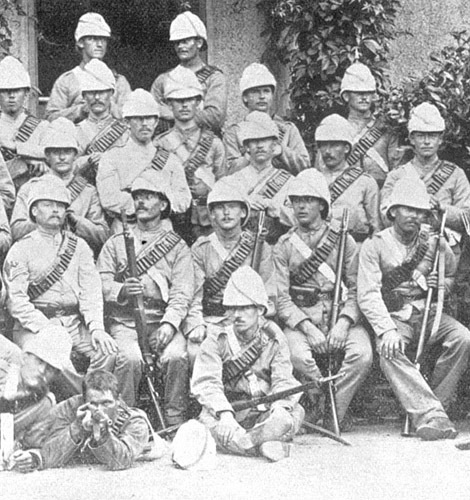 All of the Egyptian and Sudanese soldiers in the Nile campaign were armed with Remingtons, ordered by the Egyptian government in the late 1860s. Chambered in '.43 Egyptian', the Remington ‘rolling block’ was another ingenious breech-loading design - a drum of steel snapped shut over the breech once it was loaded, and then locked tight when the trigger was pulled and the hammer closed over the drum before striking the firing pin. Because the operation require three steps - manually cocking the hammer, thumbing open the block and then closing it - the Remington was slower to reload than the Martini-Henry, and the cartridge was slightly less powerful. Nevertheless, it was a reliable, robust rifle, over a million being produced in various calibres by the Remington factory in New York State, providing rifles for buffalo-hunters in the American west – where it vied with the Sharps rifle - as well as for the many countries that adopted it as their military arm, including Egypt, Spain and Norway. It was widely available across north Africa, where it may have been favoured by tribesmen because its distinctive shape in the grip area was similar to the slender flintlock and snaphaunce guns that had been their main armament previously. Remingtons were also used by Mahdist warriors, known to the British as 'dervishes', who had picked up the rifles from the battlefield. In 1883, before Gordon returned to Khartoum, the Egyptian governor of Sudan hired a former Indian army officer named William Hicks, remembered as ‘Hicks Pasha’, to lead a ragtag force of Egyptian and Sudanese troops - an army described by Winston Churchill as ‘the worst in the world’ – against the Mahdi, a doomed enterprise that resulted in their annihilation at the battle of El Obeid and thousands of Remington rifles falling into dervish hands. The dervishes are remembered from later battles such as Abu Klea for their suicidal charges and ferocious hand-to-hand combat, but they had also became proficient marksmen and their Remingtons were responsible for hundreds of British, Egyptian and Sudanese casualties during the campaign. The Remington being held by my nephew Michael in my photos well may be one of those rifles, its original Egyptian ownership revealed by markings in Arabic stamped above the breech. The rifling is worn down from extensive use, though the bore is shiny and well looked after - as would have been the case not only for government troops but also for Mahdist warriors well aware of the corrosive effects of black powder. I haven’t tried firing this rifle, as it has a slight loosening of the breech block. I’m mindful of General Gordon’s accident with a Remington while 'sharpshooting' from Khartoum over the Nile, recounted in his journal entry for 2 December 1884: 'I nearly lost my eyes this morning, firing on Arabs, the base of the brass cartridge blew out, and sent the fire into my face; this is a fault of the Remington; the metal case of this cartridge must not be used too often.' The fault probably lay with his troops reloading the brass too often and weakened it, factory ammunition no longer being available to the beleaguered garrison. Gordon's accident represents one small outcome of the British government's refusal to heed his warnings about the rise of the Mahdi, the wider consequences of which are still with us today. VIDEO: click on the image below to see me shooting the Martini-Henry rifle in these photos.